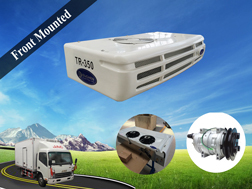 TR-200T van refrigeration unit is specialized for keep your refrigerated van at a constant temperature which direct driven by the vehicle engine, also called direct driven van refrigeration units, this cooling system is designed for transportation of fresh or frozen goods in small vans with container volume of 2~12m³. 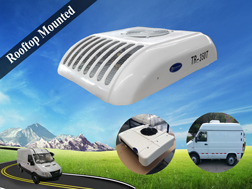 TR-200T van refrigeration units has a fashionable appearance, which is compatible with vehicle and van body, and mainly installed on the rooftop of the van, panel van, cargo van, commercial van, and small truck, etc. 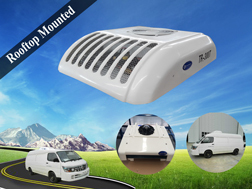 also supplying the front mounted TR-200 van refrigeration units as the same cooling capacity. 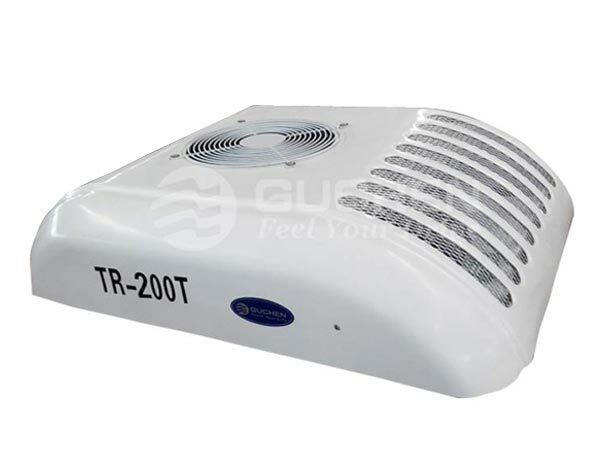 Tips: Please look for Guchen Thermo TR-200T new model of cargo van refrigeration units , you can also see Guchen Thermo C-200Tvan chiller units for fresh transport business. 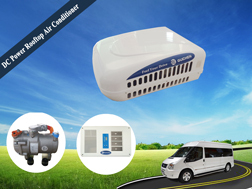 ◆ Cooling-capacity of refrigerant van up to 2000W, 2559Kal/h (0℃/+32℉); 1127W, 1311 Kal/h (-18℃/ 0℉). 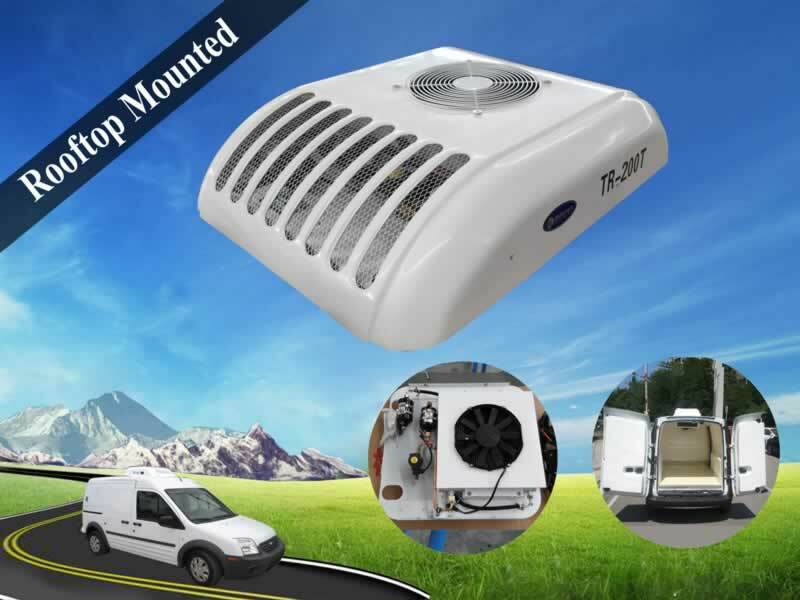 ◆ Rooftop mounted refrigeration units for vans, easy to install, more convenient to maintain, and saving a lot of operating costs. 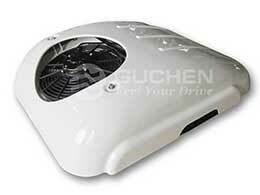 ◆ Large wind volume of air blowing, keep the high quality of the goods in the refrigerated van box or truck box. ◆ Computer controlling system, easy to operate, and manipulation is convenient and safe. 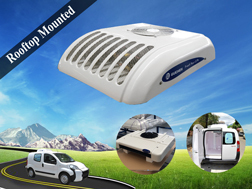 ◆ Voltage display and high-low voltage alarm system. 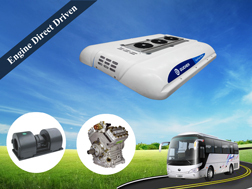 ◆ Date logger, heating and standby power function is optional. 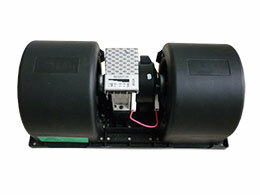 ◆ ISO9000:2008 & CE Certificate. ● Liquid injection solenoid valve, will spraying the liquid (Coolant ) under high temperature conditioners and protect the compressor. 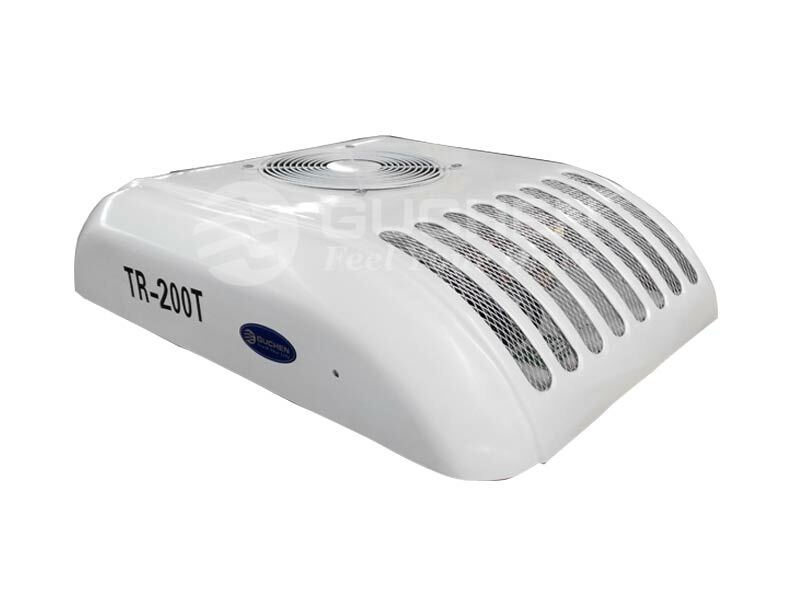 ● Safety mounting structure, which can improve the protection against electromagnetic interference. 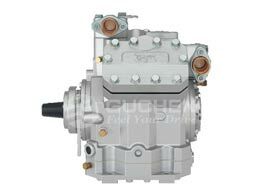 Guchen Industry is a specialized van refrigeration units manufacturer in China, as the leading van refrigeration units supplier, we also supplying refrigerated van body, electrical van refrigeration units, DC powered van air conditioner, van air conditioning system, in order to not only servicing drivers have a comfortable climate, but also keeping their cargo have a constant temperature.